A cat’s purr is soothing to one’s soul. What can be more comforting than to hear your feline’s motor in idle? Let’s explore how the purr benefits us and them! A cat’s purr is akin to a smile – a nervous smile, an anxious smile, or a simple happy smile. But just don’t assume a cat is always happy because it’s purring – that simply is not the case! 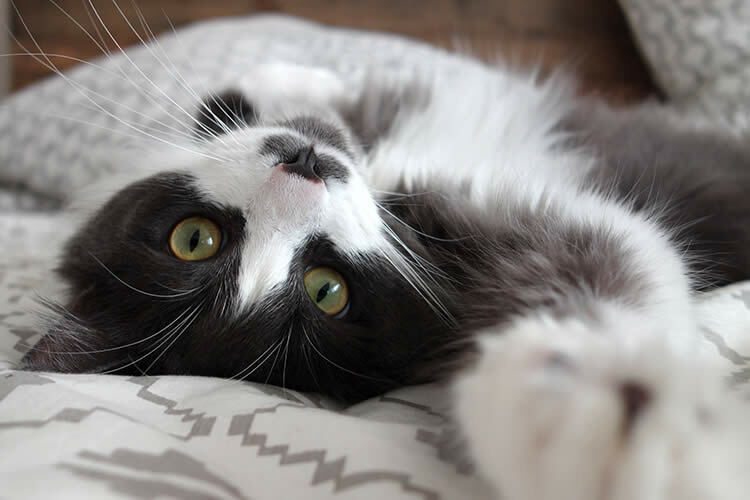 Of course when your cat hops up onto your lap, purrs, and stretches out for a well deserved body rub then you know you have one happy feline – but those purrs vary with circumstances. A visit to the veterinarian, for instance, can start a purr signifying fright or nervousness! In a cat’s brain a repetitive neural oscillator transmits messages to the larynx and diaphragm muscles. This causes those muscles to twitch at a rate of 25-150 vibrations per second. When this occurs the vocal cords separate when the cat inhales and exhales and, thus, produces a purr. Interestingly enough, not all cats can purr. Those that can’t purr are usually the large cats and they, instead, ROAR! Purring would be difficult for the large cats because their larynxes aren’t stiff enough to allow the structures surrounding the larynx to allow purrs. The roarers include lions, jaguars, tigers, snow leopards, and clouded leopards. The Purr-ers include cheetahs, cougars, domestic cats, and their relatives such as mongooses and civets. Did you know that even raccoons, hyenas, and guinea pigs can purr? The large cats (lions, tigers, etc.) have to move around a lot in order to catch prey so they roar to protect their prides and their territory. The smaller, purring cats are usually loners and have no need to compete for prey. For communication they use scent and mark their territory. Domestic cats have the ability to hide a plaintive cry (or moan) within their purr that has the ability to irritate humans while appealing to their “motherly” instincts. This “purr-cry” is similar to a baby’s cry with a range of 300 to 600 hertz. And why would a cat cry like this in the first place? Just ask the researchers who say “How do cats get you to feed them sooner?” The answer is cats rely on the inherent tendencies in humans to nurture and protect their young! A ten year study at the University of Minnesota Stroke Center suggests a cat’s purr can be healthy and beneficial to cat owners. Researchers found that cat owners were 40 percent less likely to have heart attacks than non-cat owners. Could the cat’s purr be contributing to lowering blood pressure and relieving stress? It could be true because this auditory stimulus is often attributed to calmness and peacefulness – something everyone needs these days in this hectic and volatile world! Tom Matteo has been a freelance writer since 1992. He has written hardware and software reviews for computers and gaming systems, and now writes about animal behavior and care. Tom resides in Bethlehem, PA with his wife, Tina, and their beloved cockapoo, Angel.